The strong links between Ulster and Scotland meant that piping became a strong cultural tradition. Bagpipes were made by Scottish craftsmen and imported to Ireland. A small number of pipe bands were scattered around the province in the early 20th century. 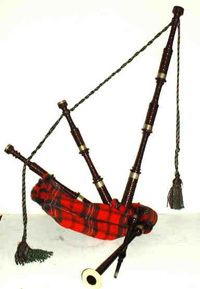 Unlike the Irish pipes, bagpipes had to have a chanter through which the player blew.